I came across the first image on a website a while ago, but lost the link. 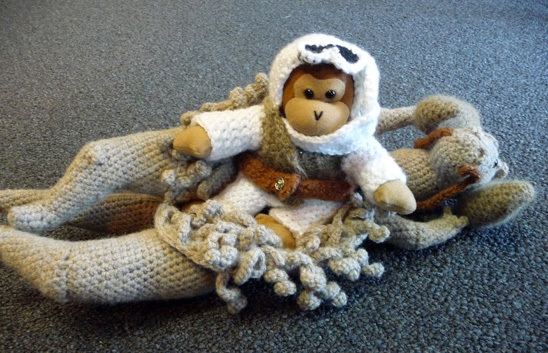 So I googled “crocheted monkey tauntaun costume with guts”, and found it again. It HAS to be the coolest Google searches I ever did… Turns out that Mara made it for a contest by the geekily cool online retailer Think Geek: the challenge was to dress their mascot Timmy for an upcoming ComiCon. But more importantly, go to Mara’s blog and check all the pictures out.